I can’t say enough positive things about Dr. Dagmar Kalemba and the staff at Onxy Denture Clinic in Okotoks. Dr. Dagmar has always made me feel at ease and confident with my dentures. I have never felt rushed during my appointments which is very important to me. She takes time to listen to my concerns and solves any issues I may have immediately. Dr. Dagmar is an amazing denturist – extremely knowledgeable, caring, considerate, thorough, and honest, with a great personality! I feel more like a friend than a patient. I have attended this clinic for the past 4 or 5 years, and have received the most professional and caring attention anyone could ever want. Nothing is too big or too small a job for Dagmar and her staff. One of the most important parts of this business is the friendly and home based feelings one gets when they walk into this office. You are greeted and taken care of … and they take time to spend time with you making sure all…fits and is Ok in your mouth (NO hurt). Again I along with many other seniors from Calgary and the Okotoks area are very pleased with the work and the friendly attention given by Dagmar and her staff. Can’t tell you how pleased I was to be referred to Onyx Denture Clinic. I was referred there by a new dentist who added 2 more implants to attach my lower denture. 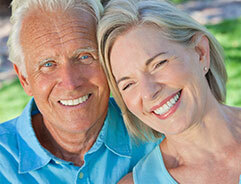 I had new dentures made and I must say – they are the best I have ever had in all my 50 years of denture wearing. I was pleased to not have to go every week for 6 weeks for impressions etc. I never had a set where my bite was right – well these are wonderful. They fit like a glove and they look great. I would gladly refer you to see Dagmar at Onyx – a person who truly cares about your well being! My experience has been amazing. I still get a bit nervous because of my bad experiences in the past but the staff at Onyx have given exceptional care and service. The best part of this whole experience is super looking teeth and a tremendous fit. My thanks to the team at Onyx. I am 52 years old and had to get dentures. 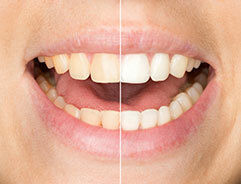 My new teeth look natural and fit great thanks to Onyx Denture Clinic. I highly recommend them for their professionalism, courtesy and personalized service. I’m looking forward to eating corn on the cob again! As a patient with very complex denture needs, Onyx Denture and Implant clinic offered me professional expertise in a caring, supportive environment. Dental personnel excelled in assessment, proper fit, comfort and appearance with ongoing follow-up care. I highly recommend them.